Do you sometimes feel like you're just hanging in there? 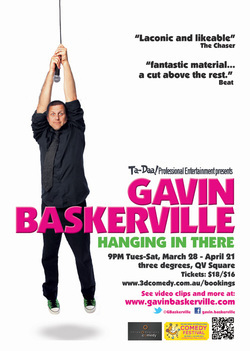 2005 Moosehead Award Recipient Gavin Baskerville can help with an hour of insightfully witty stand-up laughs. It's 10 years since his first solo show and Gavin's celebrating, not just by looking back over all he has (and hasn't) achieved but he's also looking forward to what's to come now he's turned 40.